Finland is the northernmost country on the European continent. Although other countries have points extending farther north, virtually all of Finland is north of 60 degrees north latitude; nearly a quarter of the land area and fully one-third of the latitudinal extent of the country lie north of the Arctic Circle. In area, Finland has 304,623 square kilometers of land and 33,522 square kilometers of inland water, a total of 338,145 square kilometers. It shares borders on the west with Sweden for 540 kilometers, on the north with Norway for 720 kilometers, and on the east with the Soviet Union for 1,268 kilometers. There are approximately 1,107 kilometers of coastline on the Gulf of Finland (south), the Baltic Sea (southwest), and the Gulf of Bothnia (west). The rugged coastline is deeply indented with bays and inlets. The offshore region is studded with islands. The most predominant influences on Finland's geography were the continental glaciers that scoured and gouged the country's surface. When the glaciers receded about 10,000 years ago, they left behind them moraines, drumlins, and eskers. Other indications of their presence are the thousands of lakes they helped to form in the southern part of the country. The force of the moving ice sheets gouged the lake beds, and meltwaters helped to fill them. The recession of the glaciers is so recent (in geologic terms) that modern-day drainage patterns are immature and poorly established. The direction of glacial advance and recession set the alignment of the lakes and streams in a general northeast to southwest lineation. The two Salpausselka Ridges, which run parallel to each other about twenty-five kilometers apart, are the terminal moraines. At their greatest height they reach an elevation of about 200 meters, the highest point in southern Finland. Many countries of the world can be divided into distinct geographic regions, in each of which some physical characteristic is dominant, almost to the exclusion of others. In Finland, the same physical characteristics are common to each of the four geographic regions into which the country is divided. Regional differences in Finland lie, therefore, in subtle combinations of physical qualities. In archipelago Finland, rock and water are dominant. Coastal Finland consists of broad clay plains where agriculture plays a leading role. The interior lake district supports extensive forests. Upland Finland is covered by Arctic scrub. Nonetheless, each of these regions contains elements of the others. For instance, patches of agriculture extend far northward along some rivers in Lapland, and in southern Finland a substantial bogland, the Suomenselka, is sometimes referred to as Satakunta Lapland because it has the character of Arctic tundra. Archipelago Finland, consisting of thousands of islands and skerries, extends from the southwestern coast out into the Baltic Sea. It includes the strategically significant Aland Islands, positioned at the entrance to the Gulf of Bothnia. After World War I, both Finland and Sweden laid claim to the islands, which are culturally more Swedish than Finnish. For strategic reasons, however, the League of Nations awarded the Aland Islands to Finland in 1921. A principal reason for this decision was that, during the winter, the islands are physically linked to Finland by the frozen waters of the sea and are hence essential for the country's defense. This myriad of forest-covered and bare bedrock islands was formed and continues to be formed by the process of uplift following the last glaciation. The rest of the country is also still emerging from the sea. The weight of the continental glaciers depressed the land over which they moved, and even now, a hundred centuries after their recession, Finland is rising up from this great load through the process of isostatic rebound. In the south and the southwest, this process is occurring slowly, at a rate of twenty-five to thirty centimeters a century. Farther north in the Ostrobothnia area, uplift is more rapid, it amounts to eighty or ninety centimeters a century. The process also means that Finland is growing about seven square kilometers yearly as land emerges from the sea. Coastal Finland consists of broad clay plains extending from the coast inland, for no more than 100 kilometers. These plains slope southward from the morainic Salpausselka Ridges in southern Finland. Along the Gulf of Bothnia coast, the plains slope southwest from upland areas. The land of coastal Finland is used for agriculture and dairy farming. The interior lake district is the largest geographic region, and it is perhaps what most foreigners think of when they imagine Finland. The district is bounded to the south by the Salpausselka Ridges. Behind the ridges extend networks of thousands of lakes separated by hilly forested countryside. This landscape continues to the east and extends into the Soviet Union. As a consequence, there is no natural border between the two countries. Because no set definition of what constitutes a lake and no procedures for counting the number of lakes exist, it has been impossible to ascertain exactly how many lakes the region has. There are, however, at least 55,000 lakes that are 200 or more meters wide. The largest is Lake Saimaa, which, with a surface area of more than 4,400 square kilometers, is the fifth largest lake in Europe. The deepest lake has a depth of only 100 meters; the depth of the average lake is 7 meters. Because they are shallow, these many lakes contain only slightly more water than Finland's annual rainfall. The hilly, forest-covered landscape of the lake plateau is dominated by drumlins and by long sinuous eskers, both glacial remnants. Upland Finland extends beyond the Arctic Circle. The extreme north of this region is known as Lapland. The highest points in upland Finland reach an elevation of about 1,000 meters, and they are found in the Kilpisjarvi area of the Scandinavian Keel Ridge. In the southern upland region the hills are undulating, while in the north they are rugged. Much of upland Finland is not mountainous, but consists of bogs. Finland's longest and most impressive rivers are in the north. The Kemijoki has the largest network of tributaries. Farther south the Oulujoki drains the beginning of the north country. Most of the streams flow to the Gulf of Bothnia, but there is a broad stretch of land in the north and northeast that is drained by rivers flowing north across Norway and northeast across the Soviet Union to the Arctic Ocean. 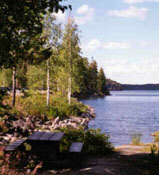 Latitude is the principal influence on Finland's climate. Because of Finland's northern location, winter is the longest season. On the average, winter lasts 105 to 120 days in the archipelago and 180 to 220 days in Lapland. This means that southern portions of the country are snow-covered about three months of the year and the northern, about seven months. The long winter causes about half of the annual 500 to 600 millimeters of precipitation in the north to fall as snow. Precipitation in the south amounts to about 600 to 700 millimeters annually. Like that of the north, it occurs all through the year, though not so much of it is snow. The Atlantic Ocean to the west and the Eurasian continent to the east interact to modify the climate of the country. The warm waters of the Gulf Stream and the North Atlantic Drift Current, which warm Norway and Sweden, also warm Finland. Westerly winds bring the warm air currents into the Baltic areas and to the country's shores, moderating winter temperatures, especially in the south. These winds, because of clouds associated with weather systems accompanying the westerlies, also decrease the amount of sunshine received during the summer. By contrast, the continental high pressure system situated over the Eurasian continent counteracts the maritime influences, causing severe winters and occasionally high temperatures in the summer.